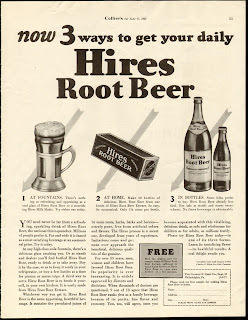 Charles Elmer Hires, a pharmacist, started marketing Hires Root beer in the 1870's. At first it drew the ire of the Temperance Movement because of the "beer" moniker, but after lab testing proved it had very little alcohol they turned around and started lauding it as the drink of Temperance. 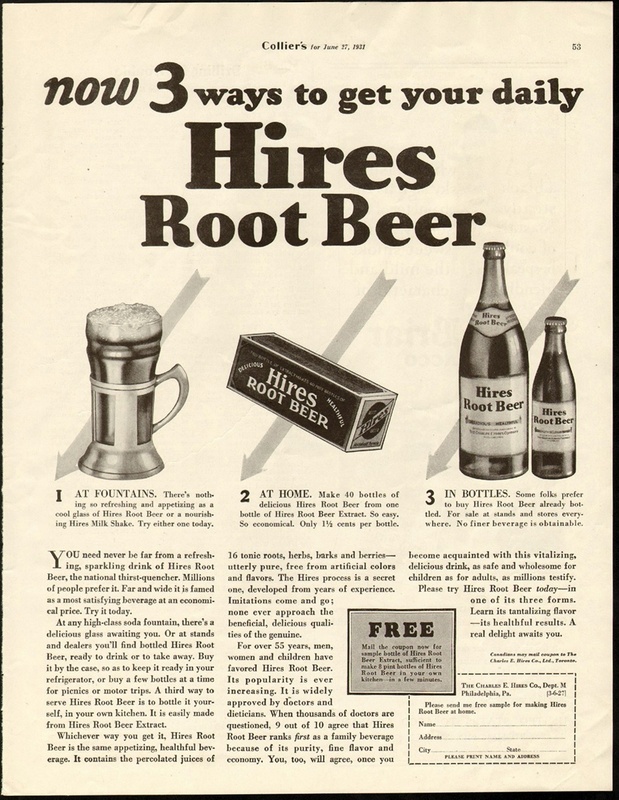 Hires also sold his root beer as a health drink because of the inclusion of Sassafras Oil which was thought to have medicinal properties. In 1960, use of the oil was discontinued due to the discovery of carcinogenic properties, however a way was discovered a few years later, to strip the carcinogens out of the Sassafras Oil and use was resumed. In this ad we see the 3 primary ways to enjoy Hires, at the Soda Fountain, in glass bottles or made at home using a root beer kit. The kits were sold until sometime in the 1980's when the company discontinued production due to nonexistent sales. The Hires Company was bought by various other corporations over the years, eventually ending up as a part of Cadbury Schweppes under their Dr Pepper/Snapple Group.